Stiebel Eltron - Service Reps, Inc. Since 1924 we’ve been a family-owned business dedicated to engineering excellence and high-quality manufacturing of superior products because our customers deserve the best. Compared to a conventional electric tank water heater, a tankless electric water heater will typically use 15–20% less energy, although savings can be substantially higher depending on usage habits. Conventional electric tank water heaters continually store hot water and as a result lose 15-20% of the total energy they consume to the environment around them. This is called standby heat loss. Gas or oil tank water heaters are even less efficient due to the fact that they also must be vented to the outdoors. 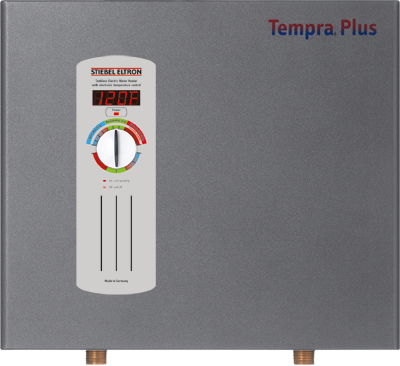 A tankless electric water heater does not need to be vented, and does not store full temperature hot water waiting for you to use it. 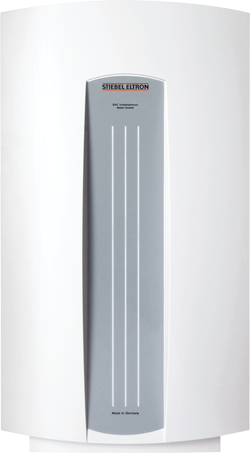 The new DHC-E is a powerful, flexible, point-of-use water heating solution. The mighty DHC-E 12 offers high 12 kW output, in an affordable, compact package. Great for that kitchen sink at the end of a long pipe run, or for multiple low-flow sinks in a commercial application. 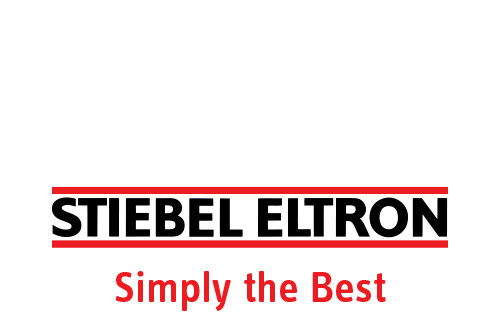 Stiebel Eltron has an enviable track record of engineering excellence and product quality. The three-year parts warranty is unique in the industry. You can depend on a DHC-E for many years to come. Stiebel Eltron DHC tankless water heaters are designed for installation at the point-of-use. 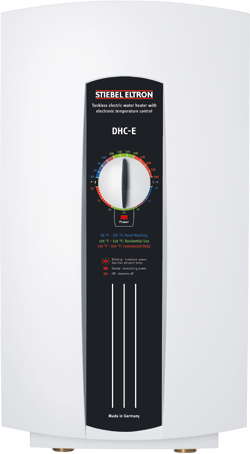 The DHC heats water instantaneously as it flows through the unit. Stand-by heat losses are completely eliminated. DHC 3-1, DHC 3-2 and DHC 4-2 models are shipped with 0.5 GPM pressure compensating flow reducer/aerators that fit on most faucets. Flow controls and faucet aerators are highly recommended in conjunction with tankless water heaters. No pressure relief valve, drains, or circulating pumps needed. 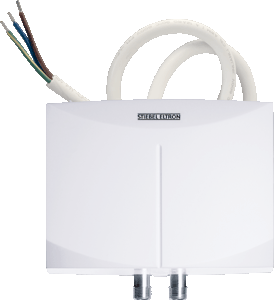 The Stiebel Eltron Mini™ tankless water heaters are designed for installation at the point-of-use. The Mini™ heats water instantaneously as it flows through the unit. Stand-by heat-losses are completely eliminated. The efficient heating elements are controlled by a simple flow switch. 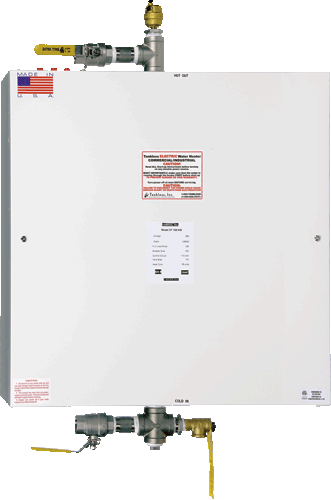 Additionally, all Mini water heaters are equipped with a safety high-limit with manual reset. Flow controls and faucet aerators are highly recommended in conjunction with tankless water heaters. The Mini-E 2-1 is internally restricted to 0.40 GPM. The Mini-E 2-1, 2.5-1, 3-1, 3.5-1 and 4-2 models ship with a 0.5 GPM pressure compensating flow reducer / aerator. The Mini-E 6-2 model ships with two 0.5 GPM aerators. Substitute a 1.0 GPM pressure compensating flow-reducer/aerator if plumbed to 1 sink. All aerators are designed to fit most common faucets. No pressure relief valve, drains, or circulating pumps are needed. The Stiebel Eltron Mini tankless water heaters are designed for installation at the point-of-use. The Mini heats water instantaneously as it flows through the unit. Stand-by heat-losses are completely eliminated. The efficient heating elements are controlled by a simple flow switch. Additionally, all Mini water heaters are equipped with a safety high-limit with manual reset. Flow controls and faucet aerators are highly recommended in conjunction with tankless water heaters. The Mini 2-1 is internally restricted to 0.32 GPM. The Mini 2-1, 2.5-1 and 3-1 models ship with a 0.5 GPM pressure compensating flow reducer / aerator. The Mini™ 3.5-1 and 4-2 models ship with a 0.66 GPM pressure compensating flow reducer / aerator. The Mini 6-2 model ships with a 1.0 GPM aerator. All aerators are designed to fit most common faucets. No pressure relief valve, drains, or circulating pumps are needed. An SHC mini-tank frees up precious space while providing plenty of hot water for hand washing or kitchen applications. Why store 30 or more gallons of hot water when 6, 4, or even 2.5 gallons are sufficient? Plumbed with cold water and used as a stand-alone supply of hot water, or plumbed with hot water from a remote tank to minimize delays, an SHC always delivers hot water when needed. By putting hot water right where it is used, pipe runs are minimized and water and energy use reduced. 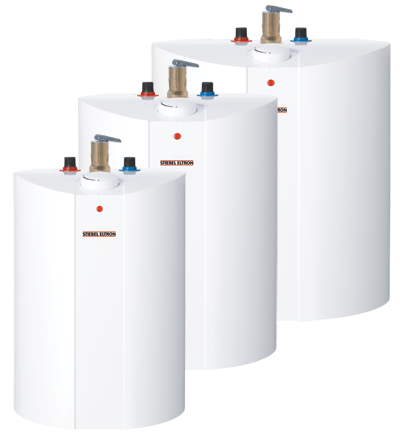 The smaller tank coupled with superb insulation reduces stand-by losses especially when compared with larger tank-type water heaters. At Stiebel Eltron, our goal is to provide energy efficiency in addition to comfort. Our heat pump water heaters are designed from the ground up to rely on the heat pump, not on the back-up element because that is the most efficient way. Our “50-gallon” heat pump water heater is actually 58 gallons and our 80-gallon model is, well, 80 gallons, because large is the best for a heat pump water heater. Large capacity means the water you are using, as much as possible, was heated the most efficient way — with the heat pump. We super-insulate our tanks, because minimizing stand-by losses means less energy is wasted. For maximum energy savings it makes no sense to skimp on the insulation and increase energy consumption. We use a single resistance element for back-up water heating during times of high demand. Our single booster element is located in the most efficient place — at the very top of the tank because that’s where the hot water is drawn from. Tankless, Inc. 3-phase water heaters from Stiebel Eltron offer a reliable and efficient way to heat water in demanding commercial, industrial, and safety applications. Available in all common 3-phase voltages including 208, 240, 480 Delta or Wye, 575 V.